Preheat oven to 350º F. Line a 13 x 9 baking pan with parchment paper or aluminum foil, allowing ends to drape over edges of the pan. Spray the pan liner with vegetable spray. Set it aside. In a medium bowl, place brownie mix, melted butter, and eggs. Combine the mixture using an electric mixer or wooden spoon just until ingredients are blended and dry ingredients are absorbed. Fold in chopped apples and ½ cup chopped nuts. Pour the brownie batter into the prepared pan. Use an angled spatula to spread it evenly. Sprinkle the brownie surface with remaining nuts and dried apples. Bake brownies 28-32 minutes. Do not overbake. Remove pan from the oven and allow them to cool completely. Set the baking pan to the refrigerator for at least 30 minutes to allow brownies to firm for cutting. Remove brownies from the refrigerator. Lift the brownies from the pan by grasping the ends of the foil or paper liner and transferring them to a cutting board. Peel away foil or paper layer. Use a sharp knife to cut brownies into squares. Melted butter gives the brownies a richer flavor, but you can substitute vegetable oil. You can chop apples finely in a food processor rather than using a grater, but do not drain them. The apple juice helps moisten the brownies. 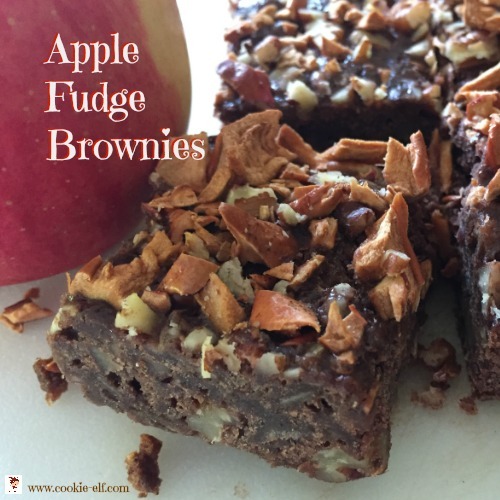 The walnuts and dried apples are optional but make the brownie surface look better – optional if you’re simply feeding hungry troops at home.